Habit: Perennial herb, woody caudex 0, glaucous, generally glabrous. Stem: (2.5)6--15(18) dm, glaucous, simple or few-branched. Leaf: glabrous except margins ciliate, basal generally rosetted, oblanceolate to obovate; mid-cauline sessile, 3.5--11(15) cm, 0.6--1.4 cm wide, lanceolate to narrowly ovate, entire to wavy (dentate), base lobed to clasping; distal reduced. Inflorescence: dense in bud, later open; terminal sterile flower cluster 0. Flower: calyx bell-shaped, sepals 7--10 mm, broadly ovate to oblong, not keeled, purple, tips hairy or not; petals 9--12 mm, 0.5--1 mm wide, not crinkled, light purple, proximal halves pale yellow; filaments free, 4 long, 2 short; anthers all fertile, 3--4 mm. 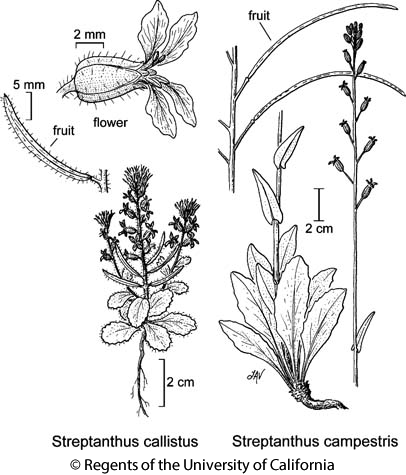 Fruit: ascending to spreading, 6--14 cm, 2--3.5 mm wide, straight or +- curved, not constricted between seeds; valves glabrous, midvein obscure; stigma 2-lobed; pedicels spreading-ascending, 5--18 mm. Seed: 50--102, 2--3 mm, oblong; wing 0.1--0.2 mm wide at tip. Citation for this treatment: Ihsan A. Al-Shehbaz 2012, Streptanthus campestris, in Jepson Flora Project (eds.) Jepson eFlora, http://ucjeps.berkeley.edu/eflora/eflora_display.php?tid=45727, accessed on April 23, 2019. TR, PR; Markers link to CCH specimen records. Yellow markers indicate records that may provide evidence for eFlora range revision or may have georeferencing or identification issues. Purple markers indicate specimens collected from a garden, greenhouse, or other non-wild location.